Not too many steps, a easy old fashioned Italian Style Sponge cake, my grandmother made this often...and was her favorite cake, soaked in dark rum. When I was little grandma and I would occasionally walk to a local bakery to buy miniature rum cakes, they were so good. They had delicious rum pudding filled sponge cakes. That is also a great alternative in making this fresh cake into that special filled pudding rum cake, recipe at the end, ....and it makes an amazing cake! She has long sinced passed in 1975. RIP grandma...and thank you. Beat whites until very stiff, set aside. Beat yolks in a separate bowl until thick and lemon colored. Add sugar, cornstarch, baking powder, salt , sifted flour and flavoring. Fold in egg whites. Pour into prepared pan. Use two small 8 inch rounds, or brownie pan for tiramisu do not grease sides of pan just the bottom only. You can also use a tube pan if you just want a plain cake no fillings or topping. Bake at 350 for 45 minutes or till brown. Cool. Your cake is now ready for your favorite creation. Fill cake layer. Top with whipped cream. I love the pictures with the whisk. Looks so good! looks so fine!a great treat for 4'th of july! I love all kinds of foam cakes! I shall try using some dark rum to saok the cake next time. It sounds really wonderful. The pictures are lovely and the cake looks perfect! Beautiful memories of your Grandma! And a beautiful cake! I bet the rum made it extra special. Looks like you're all set for a tasty 4th!! I love Grandma's glasses and I love her cake. I do remember when the cream rose to the top. And I adore that she continued to love that delicious rum-soaked cake all of her life. My Grandmother was very patriotic on July 4th and kept her American citizenship papers close to her heart. Thanks for sharing your story. There is nothing like a grandmothers cooking. 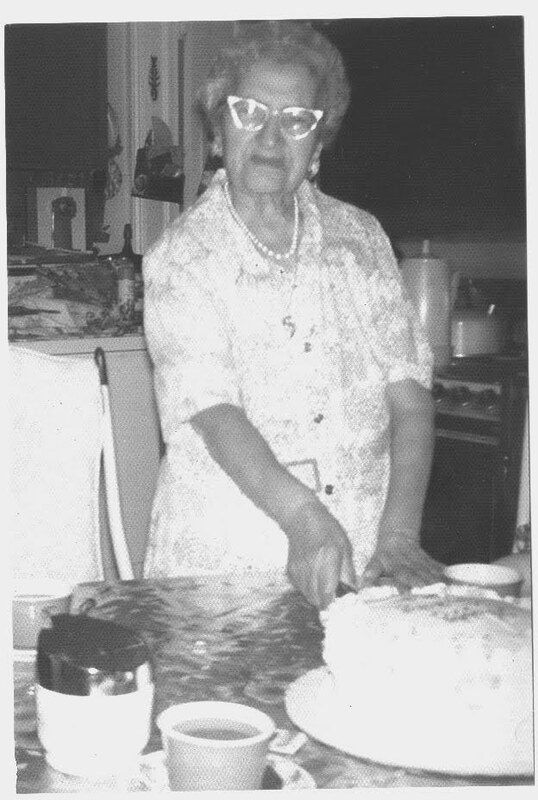 I have fond memories of my great grandmother all 4'11" of her and the delicious aromas coming from her kitchen. Great recipe! A great recipe and fantastic pictures! I would love to try this - thanks for sharing your grandmother's recipe! Hope you have a great 4th July! Looks like Grandma had a great recipe for Victoria Sponge! Your cake came out wonderful, the dark run was very nice addition! thanks for sharing some memories with of of your grandma. Happy 4th of July! Beautiful cake. My grandmother says that rum is good for the complexion especially with you soak sultanas in rum. Loved the cake! Your grandma looks so adorable, she seems like she was the sweetest lady! I was going though the Foodbuzz posts and realized that I missed this recipe. I need a good sponge recipe and this looks really delicious. Una sponge cake che é una vera poesia...bravissimissimaaaaa!!! My parents had Italian sponge cake at their wedding sixty years ago. The bakery that made it has long since closed. I used your recipe to recreate their wedding cake for their anniversary party and it was a huge hit - my dad said it tasted exactly the same, down to the hint of lemon. Molte grazie for making their day!